Get the confidence and knowhow you need to deliver more accurate cost estimates and improve profitability. The 76th edition of this bestselling cost guide has been updated and expanded to provide you with the information you need to estimate projects with confidence and accuracy, improve project planning and budgeting, and reduce risk. 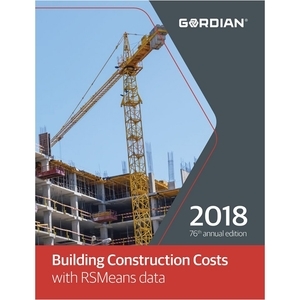 2018 Building Construction Costs with RSMeans Data is a comprehensive construction estimating cost reference. The data set in this publication is aimed primarily at estimating new commercial and industrial construction projects or large multi-family housing construction projects costing $3.5 million and more.